After completing his gallery that is due to open this Saturday, Feb 1st at 6pm, Prometheus has found some time on his hands and is now open for some special projects and commission jobs! Though the art he sells is a VERY dramatic and risque neon style, he also does some professional logos and impressive portraits in both neon or any other graphic style you want. 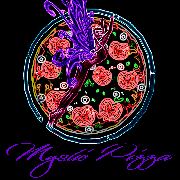 This logo was created for a local Pizza shop; Mystic Pizza. Be sure to check it out. Prometheus is always willing to go above and beyond to get the job done. Need a logo created ? 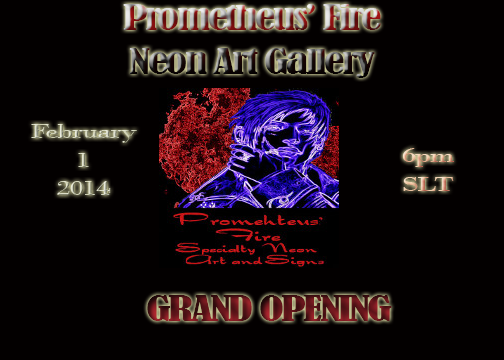 IM Prometheusunchained or visit Prometheus' Fire Specialty Neon Art and Signs/ Gallery and see his collection.